Respiratory tract infection with Pseudomonas aeruginosa is a common cause of hospitalization in immune-compromised individuals. However, the molecular mechanisms involved in the immune response to P. aeruginosa lung infection remain incompletely defined. In this study, we demonstrate that the regulator of calcineurin 1 (RCAN1) is a central negative regulator of inflammation in a mouse model of acute bacterial pneumonia using the opportunistic bacterial pathogen P. aeruginosa. RCAN1-deficient mice display greatly increased mortality following P. aeruginosa lung infection despite enhanced neutrophil recruitment and bacterial clearance. This mortality is associated with higher systemic levels of proinflammatory cytokines in RCAN1-deficient animals. These aberrant inflammatory responses coincide with increased transcriptional activity of proinflammatory RCAN1-target proteins NFAT and NF-κB. In addition, we reveal a novel regulatory role for RCAN1 in the ERK/STAT3 pathway both in vitro and in vivo, suggesting that aberrant STAT3 activity may significantly contribute to delayed resolution of inflammatory responses in our model. Together, these findings demonstrate that RCAN1 is a potent negative regulator of inflammation during respiratory tract infections. Down syndrome (DS) is caused by trisomy of chromosome 21 and represents the single most common chromosomal anomaly in live born infants, occurring with an incidence of 1 in every 600–900 live births (1–3). Along with severe mental and anatomical abnormalities, DS is associated with a wide range of immunodeficiencies (4). Included are deficiencies in adaptive immunity such as lymphopenia (5), impaired Ab response to immunization (6, 7), as well as decreased levels of IgA (8). Deficits in innate immunity have also been identified primarily involving impaired neutrophil chemotaxis (9, 10). Despite severe anatomical and mental defects associated with the condition, the most common health complication associated with DS is recurrent and persistent respiratory tract infections (11, 12), among which the greatest cause of hospital admission are bacterial and viral pneumonias (13, 14). Although there have been multiple efforts to characterize immunodeficiencies in DS patients, the molecular and genetic mechanisms that underlie many of these defects remain poorly defined. Regulator of calcineurin 1 (RCAN1) is a DS-associated gene that has recently emerged as an attractive candidate for mediating some of the immunodeficiencies associated with this syndrome. The human RCAN1 gene was previously known as DS critical region 1 (DSCR1) (15), Adapt78 (16), myocyte-enriched calcineurin-interacting protein 1 (MCIP1) (17), calcipressin 1 (18), and calcineurin-binding protein 1 (CBP1) (19). RCAN1 is located within the DS critical region on chromosome 21 and is highly expressed in various tissues, including heart, lung, kidney, brain, muscle, liver, and testis (17, 20, 21). The RCAN1 gene consists of seven exons, of which exons 1–4 can be alternatively transcribed or spliced to produce different mRNA isoforms (22). Deletion of exons 5 and 6 from the mouse Rcan1 gene leads to deficiency of the RCAN1 protein and produces mice that are viable and fertile, providing a useful tool for the study of RCAN1 function (23). RCAN1 has recently become a protein of great interest as a candidate gene responsible for various immunodeficiencies in DS patients due mainly to its prominent role in regulating two critical pathways that mediate inflammatory responses. The first pathway mediated by RCAN1 is NFAT. RCAN1 can interact directly with calcineurin in the cytosol to inhibit the phosphatase activity of the protein required for the dephosphorylation and nuclear translocation of NFAT (17, 19, 24). NFAT activation has been implicated in the function of a wide variety of immune cells, including T cells (25), B cells (26), mast cells (27), NK cells (28), and macrophages (29), where it induces various cytokines, including IL-2 (25), IL-3 (30), IL-4 (31), IL-5 (32), IL-6 (33), TNF (34), and GM-CSF (35), among others. The second inflammatory pathway mediated by RCAN1 is the NF-κB pathway. NF-κB is a major regulator of inflammation as it induces expression of a plethora of inflammatory cytokines, including IL-1β (36), IL-6 (37), TNF (38), and IL-8 (39) in humans, as well as the murine neutrophil chemoattractant chemokines MIP-2 (CXCL2) (40), keratinocyte chemoattractant (KC/CXCL1) (41), and LPS-induced CXC chemokine (LIX/CXCL5) (42). RCAN1 has been proposed to play negative regulatory roles in the NF-κB pathway through both calcineurin-dependent (43) and calcineurin-independent mechanisms (44), both of which lead to enhanced stability of a family of NF-κB inhibitory molecules known as IκB. Previous work has focused on the role of RCAN1 in the production of various inflammatory cytokines in response to immunological stimuli (45). However, the biological implications of RCAN1 during infection remain poorly understood. To examine the role of the RCAN1 during the innate immune response, we use a lung infection model of acute bacterial pneumonia that employs the opportunistic bacterial pathogen Pseudomonas aeruginosa, which is associated with high levels of morbidity and mortality among cystic fibrosis patients and immunocompromised individuals (46). We find that RCAN1 deficiency results in greatly increased mortality following P. aeruginosa infection despite enhancement of neutrophil recruitment and bacterial clearance from the lungs. The increased mortality was associated with an inappropriate early cytokine response following infection with P. aeruginosa mediated through increased activation of the proinflammatory transcription factors NF-κB and NFAT. Unexpectedly, we further identified a novel regulatory role for RCAN1 in a third inflammatory pathway leading to the activation of STAT3. These data confirm that RCAN1 is a central negative regulator of inflammatory cytokine production, and trisomy of the gene warrants further investigation as a contributing factor to immune dysfunction in DS patients. The RCAN1 gene was targeted for deletion by standard homologous recombination in embryonic stem cells (Sv129 strain), followed by generation of chimeric mice, which were subsequently bred to pass the targeted allele into the germline in the C57BL/6 genetic background, as described elsewhere (23). These mice were originally provided by J. Molkentin (Cincinnati Children's Hospital Medical Center, University of Cincinnati, Cincinnati, OH). C57BL/6 mice purchased from Charles River Laboratories and bred in the same facility as RCAN1-deficient mice were used as wild-type controls. All animal protocols were approved by the University Committee on Laboratory Animals, Dalhousie University, in accordance with guidelines of the Canadian Council on Animal Care. For survival experiments, the laboratory strain of P. aeruginosa PAK (a gift of J. Boyd, Institute of Marine Bioscience, National Research Council, Halifax, NS, Canada) was used. Mice were intranasally infected with 1 LD50 of P. aeruginosa (2.25 × 107 CFU/mouse). For antibiotic therapy studies, mice were treated as previously described (47). Briefly, animals were administered 200 mg/kg ceftazidime (Sigma-Aldrich, St. Louis, MO) s.c. every 8 h, starting 2 hours postinfection (hpi), to achieve serum levels of ceftazidime similar to those observed clinically (47, 48). Animals were monitored daily for 10 d, and the weight, body temperatures, and disease scores were measured. Serum was collected 24 h prior to infection and then 3, 6, and 12 h postinfection to monitor systemic inflammation. Moribund animals were sacrificed according to the guidelines of the Canadian Council on Animal Care. Abs for actin (sc1616), rabbit anti-goat IgG HRPO (sc2768), and goat anti-rabbit IgG HRPO (sc2004) were purchased from Santa Cruz Biotechnology (Dallas, TX). Abs for phospho-IκB (2859), total IκB (9242), phosphor-STAT3 serine 727 (9134), phospho-STAT3 tyrosine 705 (9145), total STAT3 (9132), phospho-ERK (9101), and total ERK (9102) were purchased from Cell Signaling Technology (Danvers, MA). An Ab for RCAN1 (Ab6315c) was purchased from Abgent (San Diego, CA). P. aeruginosa were cultured, as described previously (49). Briefly, suspension cultures were grown until reaching the early stationery phase. Bacteria were washed in phosphate buffer and resuspended in saline for in vivo experiments or PBS for in vitro assays. Mice were infected, as described below. Concentrations of IL-1β, TNF, IL-6, MIP2, TGF-β, LIX, and KC in the lungs and the bronchoalveolar lavage fluid (BALF), serum, and culture supernatants were determined by ELISA, as described previously, using Ab pairs from R&D Systems (Minneapolis, MN) (50). For bacterial clearance experiments, P. aeruginosa strain 8821 (a gift of A. Chakrabarty, University of Illinois, Chicago, IL), a mucoid strain isolated from a cystic fibrosis patient, was used (51). Mice were infected with 109 CFU P. aeruginosa intranasally for 24-h time points, and 107 CFU for 4-h infections. After 4 or 24 h, BALF was obtained by lavaging the lung with 3× 1 ml PBS containing soybean trypsin inhibitor (100 μg/ml). The lung tissue, spleens, and blood were obtained for detection of cytokines, myeloperoxidase (MPO), and bacterial CFUs counting. Lung tissue and spleens were homogenized in 50 mM HEPES buffer (4 μL/1 mg lung) containing soybean trypsin inhibitor (100 μg/ml). For counting bacterial CFU, 10 μL homogenate or blood was plated onto an agar dish and incubated for 24 h at 37°C. The lung homogenate was centrifuged at 4°C for 30 min at 18,000 × g. The supernatant was stored at −80°C for later cytokine analysis. The pellet was resuspended and homogenized in 0.5% cetyltrimethylammonium chloride (4 μL/mg lung) and centrifuged, as above. The cleared extract was used for MPO assay. BALF (10 μL) was plated on an agar dish and incubated for 24 h for CFU counting. For detection of cytokines and MPO activity, BALF was centrifuged at 480 × g for 5 min at 4°C. The supernatants were used for cytokine analysis. The pellets were resuspended in 1 ml NH4Cl (0.15 M) and centrifuged as before to lyse RBCs. The supernatants were discarded and the pellets were resuspended in 0.5% cetyltrimethylammonium chloride (250 μL/mouse) and then centrifuged. The cleared extracts were used for MPO assay. The MPO assay was used to determine the infiltration of neutrophils into the lungs of the mice, as described previously (52). Briefly, samples in duplicate (75 μL) were mixed with equal volumes of the substrate (3,3′,5,5′-tetramethyl-benzidine dihydrochloride, 3 mM; Resorcinol, 120 μM; and H2O2, 2.2 mM) for 2 min. The reaction was stopped by adding 150 μL 2 M H2SO4. The OD was measured at 450 nm. Nuclear protein extracts were obtained using a nuclear extract kit (Active Motif, Carlsbad, CA), according to the manufacturer's protocol. EMSA was performed, as previously described (53). Briefly, probe labeling was accomplished by treatment with T4 kinase (Life Technologies, Burlington, ON, Canada) in the presence of 32P adenosine triphosphate (Perkin Elmer, Waltham, MA). Labeled oligonucleotides were purified on a Sephadex G-25M column (GE Healthcare, Pittsburgh, PA). Ten micrograms of nuclear protein was added to a 10 μl vol of binding buffer supplemented with 1 μg poly-(dI-dC) (GE Healthcare) for 15 min. Labeled double-stranded oligonucleotide was added to each reaction mixture, which was incubated at room temperature for 30 min and separated by electrophoresis on a 6% polyacrylamide gel in 0.5× Tris–boric acid–EDTA buffer. Gels were vacuum dried and subjected to autoradiography. The following synthesized double-stranded oligonucleotides were used: NFAT-binding consensus sequence on mouse IL-13 promoter, 5′-AAGGTGTTTCCCCAAGCCTTTCCC-3′ (Sigma-Aldrich); STAT3 consensus sequence on the IL-6 promoter, 5′-GATCCTTCTGGGAATTCCTAGATC-3′ (Santa Cruz Biotechnology); and NF-κB consensus sequence on the IL-6 promoter, 5′-AGTTGAGGGGACTTTCCCAGGC-3′ (Promega, Madison, WI). Data are presented as mean ± SE of the indicated number of experiments. Statistical significance was determined by assessing means with an unpaired t test. Differences were considered significant at *p < 0.05, **p < 0.01, and ***p < 0.005. Cell lysates (15–20 μg) were subjected to electrophoresis in 10% SDS-polyacrylamide gels. Gels were transferred to polyvinylidene difluoride membrane, blotted with primary and secondary Abs, as indicated, and detected by an ECL detection system (Western Lightning Plus-ECL; Perkin Elmer). Scanning densitometry was performed using Scion Image (Scion, Frederick, MD). Previous reports have implicated the DS critical region gene RCAN1 as a negative regulator of various inflammatory pathways. However, the biological impact of RCAN1 during bacterial pneumonia remains unclear. To address this question, we used a P. aeruginosa model of acute bacterial pneumonia in wild-type (+/+) and RCAN1-deficient mice (−/−) to assess the impact of the protein on mortality and bacterial clearance in vivo. Wild-type and RCAN1-deficient mice were infected with 1 LD50 of the laboratory strain of P. aeruginosa PAK. Animal mortality was then monitored for 10 d postinfection (Fig. 1A). Unexpectedly, whereas 50% of wild-type animals succumbed to the infection, primarily between 24 and 48 hpi, 100% of the RCAN1-deficient mice died within the first 18 hpi, suggesting that RCAN1 plays a critical role in host defense against P. aeruginosa lung infection. To examine whether antibiotic therapy affects RCAN1-regulated response in P. aeruginosa infection, mice were treated with a concentration of the antibiotic ceftazidime, which yields serum concentrations similar to those achieved clinically (47, 48). Whereas antibiotic therapy was able to increase survival in wild-type animals, it was unable to rescue RCAN1-deficient mice, which all succumbed to the infection in the first 18 hpi (Fig. 1A). To further characterize the role of RCAN1 in host defense against P. aeruginosa, the impact of RCAN1 on bacterial burden was assessed in wild-type and RCAN1-deficient animals. To address this question, mice were infected intranasally with P. aeruginosa strain 8821 [isolated from the lungs of a cystic fibrosis patient (51)], as this strain is associated with lower mortality in vivo. Bacterial burden was assessed in the lung and BALF of wild-type and RCAN1-deficient mice at 4 and 24 hpi. No differences were observed at 4 hpi, most likely due to the high bacterial burden, and time required for the recruitment and phagocytosis of the bacteria by neutrophils (data not shown). Contrary to expectation, there was significantly more bacteria detected in the lungs of wild-type mice compared with RCAN1-deficient animals 24 hpi (Fig. 1B). A similar trend was observed in the BALF of RCAN1-deficient animals, but it did not reach statistical significance (Fig. 1C). To determine whether RCAN1 deficiency affects bacterial dissemination, the bacterial burden in the spleen and blood was assessed. The levels of bacteria in both the serum and spleen were decreased in RCAN1-deficient mice (Fig. 1D, 1E). These results suggest that the decreased bacterial load in the lungs was not a result of impaired containment of the infection. The bacterial burden in the RCAN1-deficient mice is lower than that in wild-type mice. As the clearance of P. aeruginosa from the lungs is largely dependent upon the recruitment of neutrophils to the site of infection (54), we next set out to measure the infiltration of these cells into the respiratory tract. Assessment of neutrophil infiltration was carried out using an assay to determine the activity of the neutrophil granule-specific enzyme MPO. MPO activity was greatly enhanced at 4 hpi in both the lung (Fig. 1F) and BALF (Fig. 1G) of RCAN1-deficient mice. These levels of MPO activity remained elevated in the lung tissue 24 hpi. However, no differences in activity were observed in the BALF at this time point. These data stand in stark contrast to previous results in other gene knockout mice we and others have generated using this P. aeruginosa lung infection model, in which increased bacterial burden is usually associated with increased mortality (49, 55, 56). Altogether, these data suggest that the increased mortality in RCAN1-deficient animals may not be directly caused by bacterial pneumonia. Due to the reported roles for RCAN1 as a regulator of inflammation, we next set out to determine whether the discrepancies between the enhanced bacterial clearance and increased mortality in RCAN1-deficient mice could be explained by susceptibility to systemic inflammation. To explore this possibility, we examined the levels of four cytokines whose increased expression has been linked to mortality associated with systemic inflammation. These cytokines are TNF (57), IL-1β (58), IL-6 (59), and a murine homolog of human IL-8, MIP-2 (60). Wild-type and RCAN1-deficient mice were infected intranasally with 1 LD50 of P. aeruginosa strain PAK. Mice were then left untreated, or were treated with the antibiotic ceftazidime every 8 h, starting 2 hpi. Serum was then collected at various time points and analyzed for levels of inflammatory cytokines. We observed that the levels of IL-6 (Fig. 2A), MIP-2 (Fig. 2B), and IL-1β (Fig. 2C) started to increase in the serum of RCAN1-deficient mice as early as 3 hpi. Levels continued to increase at 6 and 12 hpi and were significantly increased in the serum of RCAN1-deficient mice when compared with wild-type controls. Antibiotic treatment with ceftazidime modestly decreased IL-6 and IL-1β level in the serum in wild-type mice. Similarly, MIP-2 and IL-1β level in the serum of RCAN1-deficient mice was modestly reduced after ceftazidime treatment. However, the levels of these inflammatory mediators in RCAN1-deficient mice remained well above those seen in wild-type animals, suggesting that the antibiotic therapy was unable to prevent aberrant systemic inflammation that occurs in the absence of RCAN1. Together these data demonstrate that, despite enhanced neutrophil infiltration and bacterial clearance from the lungs following P. aeruginosa infection, RCAN1-deficient mice display enhanced mortality most likely due to increased systemic inflammation. We next further determined the inflammatory response in the lungs of RCAN1-deficient mice. Wild-type and RCAN1-deficient mice were infected intranasally with 107 or 109 CFU P. aeruginosa strain 8821 for 4- and 24-h infections, respectively. A mock infection with saline was used as a control. At the indicated time points, mice were sacrificed, and lung tissue and BALF were collected and analyzed for the levels of proinflammatory and immunoregulatory cytokines (Table I). The levels of all the proinflammatory cytokines examined were greatly enhanced in both the lung and BALF of RCAN1-deficient mice infected with P. aeruginosa at the early 4-hpi time point when compared with wild-type mice. At the later 24-hpi time point, few differences in inflammatory cytokine levels were observed, and the differences that persisted were smaller than those observed at 4 hpi. Interestingly, the enhanced proinflammatory cytokine response observed at 4 h was accompanied by decreased levels of the immunomodulatory cytokine TGF-β in both the lungs and the BALF of RCAN1-deficient mice. These results indicate that RCAN1 opposes the generation of an inflammatory environment through inhibiting proinflammatory cytokine production and promoting immunomodulatory TGF-β, particularly during the early stages postinfection. Macrophages are important during host defense against P. aeruginosa infection. We set out to further characterize the inflammatory response in wild-type and RCAN1-deficient bone marrow–derived macrophages in vitro. To examine RCAN1 expression in macrophages during P. aeruginosa infection, bone marrow–derived macrophages were cultured from wild-type and RCAN1-deficient mice. These macrophages were then infected with P. aeruginosa strain 8821 at a multiplicity of infection (MOI) of 1:10. Lysates were prepared at various time points and subjected to Western blot analysis. The long form of RCAN1 (37 kDa) was found to be constitutively expressed in wild-type cells; however, the short (25 kDa) form of the protein was rapidly induced in response to P. aeruginosa infection, supporting a role for the protein early in P. aeruginosa infection (Supplemental Fig. 1A, 1B). 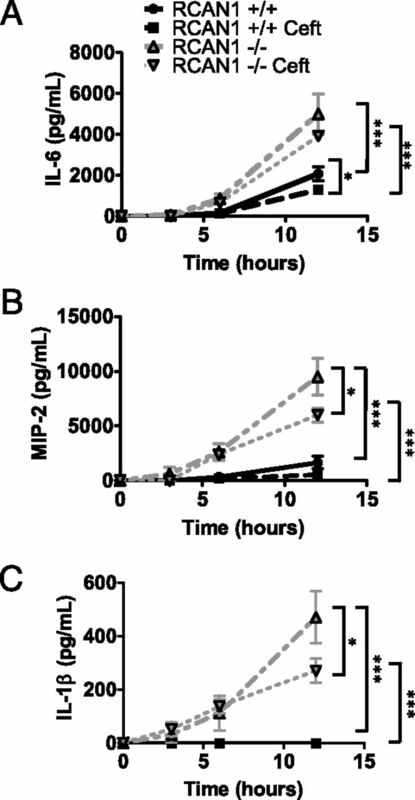 To assess the impact of this RCAN1 induction on inflammatory cytokine production, wild-type and RCAN1-deficient cultured macrophages were exposed to P. aeruginosa at various MOIs to determine the dose resulting in the optimal production of various inflammatory cytokines (Supplemental Fig. 2A–D). The optimal MOI was determined to be 1:1, as higher doses resulted in substantial cell death. Thus, this dose was used for subsequent experiments. Wild-type and RCAN1-deficient macrophages were then infected for various time points up to 48 h. The levels of secreted inflammatory cytokines, including IL-6, IL-1β, TNF, and MIP2, were tested. The levels of all the inflammatory cytokines were significantly enhanced in the supernatants of RCAN1-deficient macrophages treated with P. aeruginosa at early time points (Fig. 3A–D). Interestingly, no significant differences were observed at the later 24-hpi time point. Similar results were obtained using P. aeruginosa strain 8821 at a MOI of 1:10 (Supplemental Fig. 3A–D). These results suggest that RCAN1 plays an important negative regulatory role in inflammatory cytokine production early in infection. Reports have implicated a role for RCAN1 in regulating two distinct proinflammatory transcription factors. First, RCAN1 inhibits the activity of calcineurin, a phosphatase required for the activation of NFAT (17, 19, 24). Second, calcineurin-independent and -dependent roles for RCAN1 have been characterized for the inhibition of NF-κB through decreased phosphorylation of the inhibitory protein IκBα, leading to increased protein stability and inhibition of the NF-κB pathway (43, 44). To assess the contribution of this second pathway to enhanced cytokine production in the absence of RCAN1, lysates were collected from wild-type and RCAN1-deficient bone marrow–derived macrophages treated with P. aeruginosa strain PAK at a 1:1 MOI for various times. These lysates were subjected to Western blot analysis for total IκBα as well as the phosphorylated form of the protein and an actin-loading control (Fig. 3E). Blots from three separate experiments were quantified using scanning densitometry, and the average fold increase relative to wild-type untreated samples was determined (Fig. 3F). IκBα was found to be significantly hyperphosphorylated at the early 3- and 6-hpi time points in the RCAN1-deficient cells, whereas no significant differences were observed with longer treatments. Similar results were obtained when cells were treated with P. aeruginosa strain 8821 at a 1:10 MOI (Supplemental Fig. 3E, 3F), showing that RCAN1 impairs NF-κB activation through decreased phosphorylation of IκBα during P. aeruginosa infection. NFAT and NF-κB are master regulators of cytokine and chemokine production. We next assessed the activity of these transcription factors by performing EMSAs on nuclear extracts prepared from the lungs of wild-type and RCAN1-deficient mice infected with P. aeruginosa strain 8821 for 4 or 24 h. The activity of NF-κB was greatly enhanced in the lungs of RCAN1-deficient mice 4 hpi, whereas only a marginal increase was observed at 24 h that did not reach statistical significance (Fig. 4A, 4C). 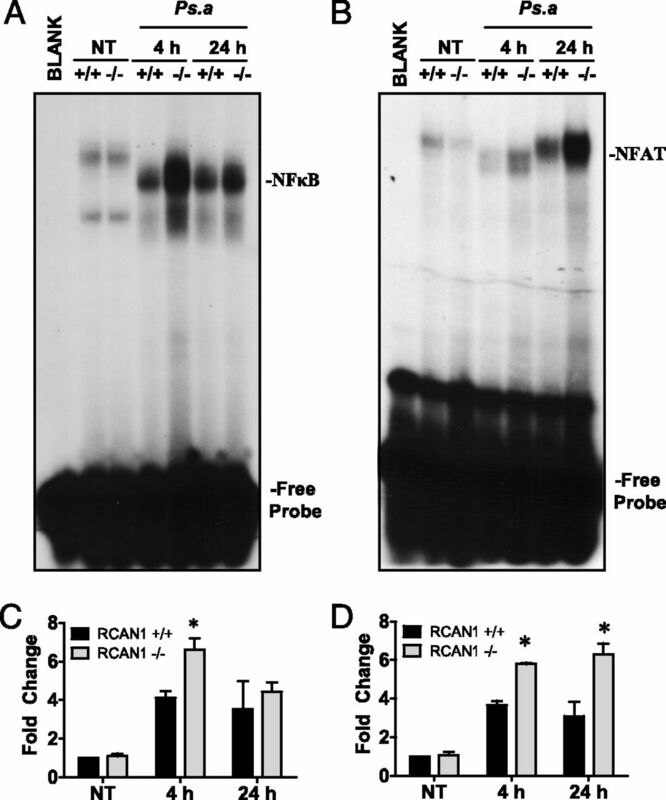 However, the activity of the proinflammatory transcription factor NFAT was greatly enhanced in RCAN1-deficient mice at both the early 4-hpi and late 24-hpi time points (Fig. 4B, 4D). Similar results were obtained for 4-h infection with 1 LD50 of P. aeruginosa strain PAK for both NFAT and NF-κB (Supplemental Fig. 4A, 4B). 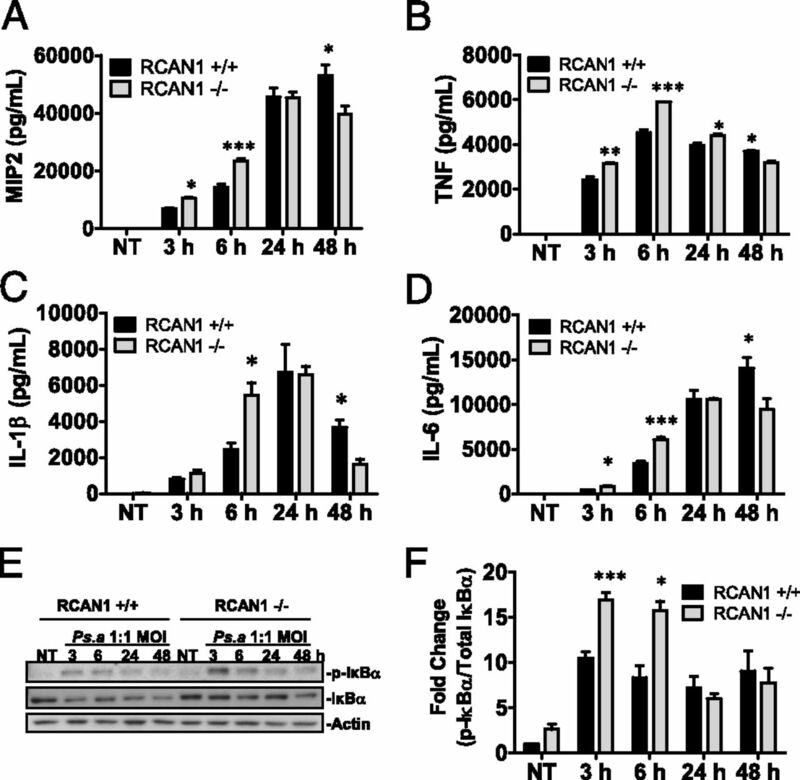 These results confirm that the RCAN1 greatly impacts the inflammatory response in vivo through temporally distinct negative regulation of two distinct proinflammatory transcription factors. Recently, increased STAT3 activity has been reported in DS patients, supporting a clinically relevant role for dysregulating of the pathway (61). However, a role for RCAN1 in the regulation of the STAT3 pathway has not been explored. To assess the activation of the STAT3 pathway in vitro, bone marrow–derived macrophages from wild-type and RCAN1-deficient mice were treated with P. aeruginosa strain 8821 at a MOI of 1:10. Lysates were collected at various times indicated, and Western blot analysis was performed. The MAPK ERK was found to be hyperphosphorylated in both untreated and RCAN1-deficient cells, as well as at early time points postinfection with P. aeruginosa (Fig. 5A, 5D). Two other MAPKs, JNK and p38, showed no differences in activation state (data not shown). As STAT3 is a target of ERK kinase activity at serine 727, a phosphorylation event required for transcriptional activity of the transcription factor (62), we next set out to determine the effects of increased ERK activation in RCAN1-deficient cells on the STAT3 pathways. Western blot analysis indicated that STAT3 was hyperphosphorylated at serine 727 in untreated RCAN1-deficient macrophages, as well as at early time points postinfection with P. aeruginosa (Fig. 5A, 5B). In addition to phosphorylation at serine 727, STAT3 activity also requires phoshorylation at tyrosine residue 705 to drive dimerization and nuclear translocation of the protein, which is induced via IL-6R (CD126) through a JAK/STAT-dependent mechanism (63). Western blot analysis showed greatly enhanced tyrosine 705 phosphorylation in both resting and P. aeruginosa–infected RCAN1-deficient macrophages compared with wild-type controls (Fig. 5A, 5C). To assess the impact on aberrant STAT3 phosphorylation in the absence of RCAN1 on transcriptional activity, nuclear extracts collected from wild-type and RCAN1-deficient macrophages were prepared and subjected to EMSA. STAT3 transcriptional activity was found to be significantly impaired at early time points postinfection in RCAN1-deficient macrophages (Fig. 5E, 5G). However, at later time points postinfection, STAT3 activity was significantly increased in RCAN1-deficient macrophages. Probe specificity was confirmed using competition and super shift assays (data not shown). Together these results indicate that the STAT3 pathway is dysregulated in RCAN1-deficient macrophages in both untreated and P. aeruginosa–treated cells in vitro. Having seen altered STAT3 activation in vitro, we next set out to measure STAT3 transcriptional activity in vivo. EMSA was performed on lungs from wild-type and RCAN1-deficient mice treated with saline (NT) or infected with P. aeruginosa strain 8821 for 4 or 24 h, using a DNA probe specific for STAT3. No STAT3 activity was observed in uninfected lungs of wild-type or RCAN1-deficient mice, and increased activity was observed in the lungs of wild-type mice 4 hpi (Fig. 5F, 5H). However, at the later 24-hpi time point, STAT3 activity was only observed in lungs of RCAN1-deficient mice. 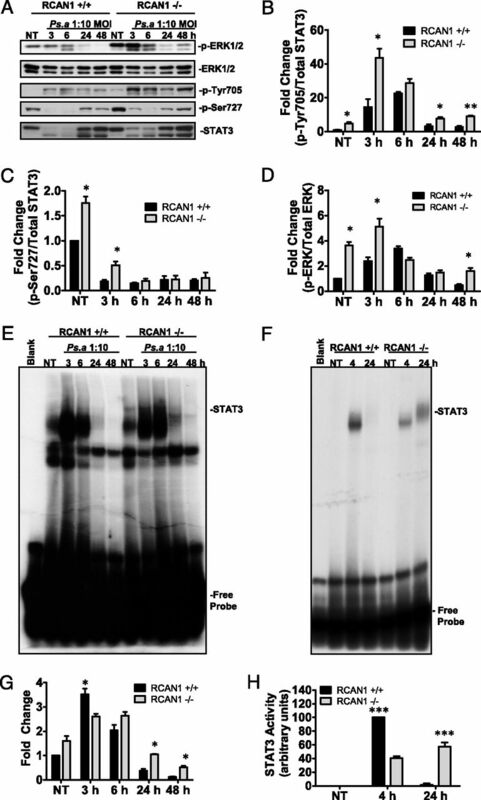 Together these data suggest that RCAN1 deficiency delays and prolongs STAT3 activation following P. aeruginosa infection in vivo. DS is the most common chromosomal anomaly among live born infants and is associated with a variety of immunological defects (1–4). These defects combined with anatomical factors associated with DS lead to greatly increased risk of severe and persistent respiratory tract infections, including viral and bacterial pneumonias (11–14). A handful of DS-associated genes has been implicated in these respiratory syndromes, and understanding their relative contributions to impaired immunological function is a critical step toward improving treatment and prevention of respiratory tract infections in these high-risk patients. In the current study, we demonstrate a critical role for the DS-associated gene RCAN1 as a negative regulator of inflammation in a P. aeruginosa model of bacterial pneumonia. RCAN1 deficiency was found to be associated with an inappropriate inflammatory response following P. aeruginosa infection both in vitro and in vivo. This unchecked inflammatory response was associated with dysregulation of three critical inflammatory pathways involving the transcription factors NFAT, NF-κB, and STAT3. The resulting increase in inflammatory cytokine production led to increased neutrophil infiltration and bacterial clearance from the lungs of RCAN1-deficient mice. However, the end result of RCAN1 deficiency was increased mortality associated with systemic inflammation, which could not be corrected with antibiotic therapy. To our knowledge, together these results show for the first time that RCAN1 is a central negative regulator of inflammation during P. aruginosa lung infections. It is worthy to note that the NFAT, NF-κB, and STAT3 pathways shown in this study to be regulated by RCAN1 are universally important during respiratory tract infections and have been extensively studied during Pneumococcus infection (64–66). Thus, it is likely that the phenotype observed in RCAN1-deficient animals may not be specific to P. aeruginosa infection. RCAN1 may represent a general host defense mechanism in greater clinical settings such as Pneumococcus infection. In addition to the novel insights into the regulation of the inflammatory response by RCAN1, this study also shed light on a previously unrecognized protective role for RCAN1 against systemic inflammation. Upon infection with 1 LD50 of P.aeruginosa, RCAN1-deficient mice all succumbed within the first 18 hpi. This mortality was associated with elevated levels of serum cytokines, demonstrating widespread systemic inflammation that could not be corrected with antibiotic therapy. Collectively, our findings help to elucidate the protective biological functions of RCAN1 in the context of infection and inflammation and implicate dyregulation of NFAT, NF-κB, and STAT3 signaling in the enhanced mortality observed in RCAN1-deficient mice. RCAN1 is widely expressed in various tissues throughout the body (17, 20, 21) and is overexpressed in DS patients (18). Intriguingly, previous studies have proposed RCAN1 as both an inhibitor (67–70) and an activator (19, 23, 71–73) of inflammation via calcineurin, suggesting that the biological activity of the protein might be context dependent. To our knowledge, our findings in this work provide the first evidence of a negative regulatory role for RCAN1 in inflammation during respiratory tract infections using an in vivo model of bacterial pneumonia. Interestingly, we found temporally distinct effects of RCAN1 on the kinetics of two important proinflammatory transcription factors. NFAT activity was greatly enhanced in the lungs of RCAN1-deficient mice throughout the course of bacterial infection. However, NF-κB activity was only observed to be enhanced early postinfection in the lungs of RCAN1-deficient mice. The differential control exerted by RCAN1 over these pathways most likely reflects distinct molecular regulatory mechanism. RCAN1 can exert sustained inhibition of NFAT via direct interactions with calcineurin (17, 19, 24). By contrast, RCAN1 controls NF-κB activation through poorly understood mechanisms leading to the stabilization of the IκB–NF-κB complex (43, 44). It is perhaps the differential regulation of these transcription factors that accounts for the cytokine profiles observed during P. aeruginosa lung infection in vivo. Whereas all inflammatory cytokines monitored were greatly elevated in RCAN1-deficient mice early in infection, fewer differences were observed later in infection, and those that remained were less pronounced. Recently, increased STAT3 expression has been reported in DS patients, implying a clinically relevant role for dysregulating of the pathway (61). As STAT3 represents an important regulator of inflammation, we set out to see what effect, if any, RCAN1 had on the pathway. Surprisingly, we identified a previously unknown regulatory role for RCAN1 in STAT3 activation, both in vitro and in vivo. Hyperactivation of the ERK MAPK was observed in vitro, coinciding with increased phosphorylation of the ERK target STAT3 at serine 727 in untreated cells, as well as at early time points postinfection. By contrast, phosphorylation of STAT3 at tyrosine 705, which was also enhanced in RCAN1-deficient cells, was only observed following P. aeruginosa infection. These patterns of aberrant STAT3 phosphorylation led to delayed and prolonged STAT3 activation following P. aeruginosa infection in vitro. Similarly, the in vivo kinetics of STAT3 activation was substantially altered in RCAN1-deficient mice, which displayed impaired early STAT3 activation that persisted later in infection, after the wild-type response had disappeared. These delayed STAT3 kinetics correlated with the levels of the immunomodulatory cytokine TGF-β, suggesting that RCAN1-mediated STAT3 activation may be playing primarily an anti-inflammatory role during P. aeruginosa lung infection. These results are not entirely unanticipated as, in contrast to NFAT and NF-κB, which are strictly proinflammatory transcription factors, STAT3 acts both to drive the inflammatory response and participate in its resolution. Indeed, various in vivo knockout models have found that inflammatory cytokine production is not impaired by STAT3 deficiency, but is instead enhanced, leading to a variety of inflammatory pathologies (74), including increased susceptibility to endotoxemia (75), as is observed in RCAN1-deficient animals. Taken together, our study demonstrates that, along with inhibition of NFAT and NF-κB activity, RCAN1 also opposes the generation of a proinflammatory environment through the promotion of immunomodulatory STAT3 activity. RCAN1-deficient mice provide a useful tool for studying the role of RCAN1 in respiratory tract infections in vivo and allow us to clearly define the role of the protein in various inflammatory pathways. Such studies would not be possible in traditional DS mouse models due to the extremely complex interplay of DS-associated genes and the intricate effects on protein expression and function resulting from trisomy of chromosome 21. Recently, a transgenic mouse model of human RCAN1 overexpression has been published in which the authors achieved expression of the protein at the elevated levels, and with a similar tissue distribution, to that seen in DS (76). It will be interesting to use these mice to test the hypothesized immunosuppressive functions of RCAN1 in a clinically relevant model of overexpression. In this study, we identify a novel role for RCAN1 as a central regulator of inflammation during respiratory tract infection in vivo. As a result, pharmacological intervention by partially modulating RCAN1 expression or function may represent a promising strategy for treating and preventing respiratory infections. Although no RCAN1 inhibitors are currently available, it may be possible to normalize expression levels by manipulating protein stability and turnover. RCAN1 turnover occurs via both proteasomal and lysosomal pathways (77, 78). However, a recent report has also shown that RCAN1 stability and its inhibitory effects on calcineurin are enhanced through a ubiquitination-like process known as neddylation involving the ubiquitin-like protein NEDD8 (79). Importantly, a well-studied first-in-class neddylation inhibitor called MLN4924 is currently in phase 1 clinical trials in cancer patients (80). As inhibition of neddylation would both enhance RCAN1 turnover and inhibit the protein’s negative regulatory effects on calcineurin, MLN4924 represents a promising avenue of investigation for relieving RCAN1-mediated immune suppression. We thank Dr. Jean Marshall for input during the writing of the manuscript. This work was supported by Cystic Fibrosis Canada (to T.-J.L.) and the Izaak Walton Killam Health Centre (to R.D.J.). Morris, J. K., and E. Alberman. 2009. Trends in Down's syndrome live births and antenatal diagnoses in England and Wales from 1989 to 2008: analysis of data from the national down syndrome cytogenetic register. BMJ 339: b3794.
. 2002. Mortality associated with Down’s syndrome in the USA from 1983 to 1997: a population-based study. Lancet 359: 1019–1025.
. 2006. National estimates and race/ethnic-specific variation of selected birth defects in the United States, 1999-2001. Birth Defects Res. A Clin. Mol. Teratol. 76: 747–756.
. 2011. Infections and immunodeficiency in Down syndrome. Clin. Exp. Immunol. 164: 9–16.
. 1990. Down syndrome (trisomy 21) thymuses have a decreased proportion of cells expressing high levels of TCR alpha, beta and CD3: a possible mechanism for diminished T cell function in Down syndrome. Clin. Immunol. Immunopathol. 55: 453–467.
. 1996. Safety and effectiveness of an acellular pertussis vaccine in subjects with Down’s syndrome. Childs Nerv. Syst. 12: 100–102.
. 1975. Defective antibody response to bacteriophage phichi 174 in Down syndrome. J. Pediatr. 86: 207–211.
. 2007. Age-dependent deficiency in saliva and salivary antibodies secretion in Down’s syndrome. Arch. Oral Biol. 52: 1088–1096.
. 1975. Defective neutrophil chemotaxis in patients with Down syndrome. J. Pediatr. 87: 87–89.
. 1983. Defective monocyte chemotaxis in children with Down’s syndrome. Pediatr. Res. 17: 292–295. 1992. Health problems and health checks in school-aged children with Down syndrome. J. Paediatr. Child Health 28: 383–386.
. 1999. Respiratory morbidity of hospitalized children with Trisomy 21. J. Paediatr. Child Health 35: 383–386.
. 2007. Down syndrome: a novel risk factor for respiratory syncytial virus bronchiolitis—a prospective birth-cohort study. Pediatrics 120: e1076–e1081.
. 2010. Community-acquired pneumonia in children: what’s old? What’s new? Acta Paediatr. 99: 1602–1608.
. 1995. A new human gene from the Down syndrome critical region encodes a proline-rich protein highly expressed in fetal brain and heart. Hum. Mol. Genet. 4: 1935–1944.
. 1997. Hamster adapt78 mRNA is a Down syndrome critical region homologue that is inducible by oxidative stress. Arch. Biochem. Biophys. 342: 6–12.
. 2000. A protein encoded within the Down syndrome critical region is enriched in striated muscles and inhibits calcineurin signaling. J. Biol. Chem. 275: 8719–8725.
. 2000. DSCR1, overexpressed in Down syndrome, is an inhibitor of calcineurin-mediated signaling pathways. Hum. Mol. Genet. 9: 1681–1690.
. 2000. Identification and characterization of a highly conserved calcineurin binding protein, CBP1/calcipressin, in Cryptococcus neoformans. EMBO J. 19: 3618–3629.
. 2007. Differential expression of members of the RCAN family of calcineurin regulators suggests selective functions for these proteins in the brain. Eur. J. Neurosci. 26: 1213–1226.
. 1997. Genomic organization, alternative splicing, and expression patterns of the DSCR1 (Down syndrome candidate region 1) gene. Genomics 44: 358–361.
. 2007. Renaming the DSCR1/Adapt78 gene family as RCAN: regulators of calcineurin. FASEB J. 21: 3023–3028.
. 2006. Modulatory calcineurin-interacting proteins 1 and 2 function as calcineurin facilitators in vivo. Proc. Natl. Acad. Sci. USA 103: 7327–7332.
. 1996. Calcineurin binds the transcription factor NFAT1 and reversibly regulates its activity. J. Biol. Chem. 271: 10884–10891.
. 1988. Identification of a putative regulator of early T cell activation genes. Science 241: 202–205.
. 1994. Induction of NF-AT in normal B lymphocytes by anti-immunoglobulin or CD40 ligand in conjunction with IL-4. Immunity 1: 179–187.
. 1996. Nuclear factor of activated T cells is associated with a mast cell interleukin 4 transcription complex. Mol. Cell. Biol. 16: 228–235.
. 1995. Activation and expression of the nuclear factors of activated T cells, NFATp and NFATc, in human natural killer cells: regulation upon CD16 ligand binding. J. Exp. Med. 182: 801–810.
. 2011. The kinase LRRK2 is a regulator of the transcription factor NFAT that modulates the severity of inflammatory bowel disease. Nat. Immunol. 12: 1063–1070.
. 1989. The immunosuppressant FK506 selectively inhibits expression of early T cell activation genes. J. Immunol. 143: 718–726.
. 1996. Two pathways can activate the interleukin-5 gene and induce binding to the conserved lymphokine element 0. Blood 88: 211–221.
. 2000. Evidence that Galpha(q)-coupled receptor-induced interleukin-6 mRNA in vascular smooth muscle cells involves the nuclear factor of activated T cells. Mol. Pharmacol. 58: 946–953.
. 1994. Calcineurin mediates human tumor necrosis factor alpha gene induction in stimulated T and B cells. J. Exp. Med. 180: 763–768.
. 1994. Calcineurin potentiates activation of the granulocyte-macrophage colony-stimulating factor gene in T cells: involvement of the conserved lymphokine element 0. Mol. Biol. Cell 5: 119–128.
. 1993. Characterization of a functional NF-kappa B site in the human interleukin 1 beta promoter: evidence for a positive autoregulatory loop. Mol. Cell. Biol. 13: 6231–6240.
. 1990. Activation of interleukin-6 gene expression through the NF-kappa B transcription factor. Mol. Cell. Biol. 10: 2327–2334.
. 1990. Kappa B-type enhancers are involved in lipopolysaccharide-mediated transcriptional activation of the tumor necrosis factor alpha gene in primary macrophages. J. Exp. Med. 171: 35–47.
. 1993. NF-kappa B subunit-specific regulation of the interleukin-8 promoter. Mol. Cell. Biol. 13: 6137–6146.
. 1993. Genomic cloning and promoter analysis of macrophage inflammatory protein (MIP)-2, MIP-1 alpha, and MIP-1 beta, members of the chemokine superfamily of proinflammatory cytokines. J. Immunol. 150: 4996–5012.
. 2008. Neutrophil chemokines KC and macrophage-inflammatory protein-2 are newly synthesized by tissue macrophages using distinct TLR signaling pathways. J. Immunol. 180: 4308–4315.
. 1994. Cloning and characterization of the human neutrophil-activating peptide (ENA-78) gene. J. Biol. Chem. 269: 25277–25282.
. 1994. Calcineurin acts in synergy with PMA to inactivate I kappa B/MAD3, an inhibitor of NF-kappa B. EMBO J. 13: 861–870.
. 2006. Down syndrome candidate region 1 increases the stability of the IkappaBalpha protein: implications for its anti-inflammatory effects. J. Biol. Chem. 281: 39051–39061.
. 2011. The calcineurin inhibitor RCAN1 is involved in cultured macrophage and in vivo immune response. FEMS Immunol. Med. Microbiol. 61: 103–113.
. 2007. The epidemiology, pathogenesis and treatment of Pseudomonas aeruginosa infections. Drugs 67: 351–368.
. 2013. Efficacy of ceftolozane in a murine model of Pseudomonas aeruginosa acute pneumonia: in vivo antimicrobial activity and impact on host inflammatory response. J. Antimicrob. Chemother. 68: 177–183.
. 1985. Pharmacokinetics of ceftazidime in elderly volunteers. Antimicrob. Agents Chemother. 28: 713–715.
. 2007. A role of Toll-IL-1 receptor domain-containing adaptor-inducing IFN-beta in the host response to Pseudomonas aeruginosa lung infection in mice. J. Immunol. 178: 3170–3176.
. 2002. Pseudomonas aeruginosa activates human mast cells to induce neutrophil transendothelial migration via mast cell-derived IL-1 alpha and beta. J. Immunol. 169: 4522–4530.
. 1998. Cellular function of elastase in Pseudomonas aeruginosa: role in the cleavage of nucleoside diphosphate kinase and in alginate synthesis. Mol. Microbiol. 30: 933–941.
. 1996. Quantitation of eosinophil and neutrophil infiltration into rat lung by specific assays for eosinophil peroxidase and myeloperoxidase: application in a Brown Norway rat model of allergic pulmonary inflammation. J. Immunol. Methods 198: 1–14.
. 2006. De novo synthesis of early growth response factor-1 is required for the full responsiveness of mast cells to produce TNF and IL-13 by IgE and antigen stimulation. Blood 107: 2814–2820.
. 2005. Virulence of Pseudomonas aeruginosa in a murine model of gastrointestinal colonization and dissemination in neutropenia. Infect. Immun. 73: 2262–2272.
. 2004. The development of early host response to Pseudomonas aeruginosa lung infection is critically dependent on myeloid differentiation factor 88 in mice. J. Biol. Chem. 279: 49315–49322.
. 2010. IFN regulatory factor 3 contributes to the host response during Pseudomonas aeruginosa lung infection in mice. J. Immunol. 185: 3602–3609.
. 1987. The toxic effects of tumor necrosis factor in vivo and their prevention by cyclooxygenase inhibitors. Proc. Natl. Acad. Sci. USA 84: 4273–4277.
. 1989. Tumor necrosis factor and interleukin-1 serum levels during severe sepsis in humans. Crit. Care Med. 17: 975–978.
. 1989. Increased plasma levels of interleukin-6 in sepsis. Blood 74: 1704–1710.
. 1991. IL-8 in septic shock, endotoxemia, and after IL-1 administration. J. Immunol. 146: 3478–3482.
. 2012. Expression of the interleukin-10 signaling pathway genes in individuals with Down syndrome and periodontitis. J. Periodontol. 83: 926–935.
. 1997. Signal transducer and activator of transcription-3 serine phosphorylation by insulin is mediated by a Ras/Raf/MEK-dependent pathway. Endocrinology 138: 4131–4137.
. 1996. Dominant negative stat3 mutant inhibits interleukin-6-induced Jak-STAT signal transduction. J. Biol. Chem. 271: 5961–5964.
. 2008. Tumor suppressor cylindromatosis acts as a negative regulator for Streptococcus pneumoniae-induced NFAT signaling. J. Biol. Chem. 283: 12546–12554. 2000. Pathogenesis of pneumococcal inflammation: otitis media. Vaccine 19(Suppl. 1): S38–S40.
. 2012. Hepatocyte-specific mutation of both NF-κB RelA and STAT3 abrogates the acute phase response in mice. J. Clin. Invest. 122: 1758–1763.
. 2005. Identification of a peptide fragment of DSCR1 that competitively inhibits calcineurin activity in vitro and in vivo. Proc. Natl. Acad. Sci. USA 102: 13075–13080.
. 2003. The threshold pattern of calcineurin-dependent gene expression is altered by loss of the endogenous inhibitor calcipressin. Nat. Immunol. 4: 874–881.
. 2011. Regulator of calcineurin 1 (Rcan1) is required for the development of pulmonary eosinophilia in allergic inflammation in mice. Am. J. Pathol. 179: 1199–1210.
. 2009. Rcan1 negatively regulates Fc epsilonRI-mediated signaling and mast cell function. J. Exp. Med. 206: 195–207.
. 2003. Dual roles of modulatory calcineurin-interacting protein 1 in cardiac hypertrophy. Proc. Natl. Acad. Sci. USA 100: 669–674.
. 2000. A conserved family of calcineurin regulators. Genes Dev. 14: 1595–1604.
. 2004. GSK-3 kinases enhance calcineurin signaling by phosphorylation of RCNs. Genes Dev. 18: 35–47.
. 2003. STAT3 deletion during hematopoiesis causes Crohn’s disease-like pathogenesis and lethality: a critical role of STAT3 in innate immunity. Proc. Natl. Acad. Sci. USA 100: 1879–1884.
. 1999. Enhanced Th1 activity and development of chronic enterocolitis in mice devoid of Stat3 in macrophages and neutrophils. Immunity 10: 39–49. Xing, L., M. Salas, H. Zhang, J. Gittler, T. Ludwig, C. S. Lin, V. V. Murty, W. Silverman, O. Arancio, and B. Tycko. 2013. Creation and characterization of BAC-transgenic mice with physiological overexpression of epitope-tagged RCAN1 (DSCR1). Mamm. Genome 24: 30–43.
. 2008. CREB activates proteasomal degradation of DSCR1/RCAN1. FEBS Lett. 582: 1889–1893.
. 2009. Degradation of regulator of calcineurin 1 (RCAN1) is mediated by both chaperone-mediated autophagy and ubiquitin proteasome pathways. FASEB J. 23: 3383–3392.
. 2012. Covalent NEDD8 conjugation increases RCAN1 protein stability and potentiates its inhibitory action on calcineurin. PLoS One 7: e48315.
. 2012. MLN4924: a novel first-in-class inhibitor of NEDD8-activating enzyme for cancer therapy. Expert Opin. Investig. Drugs 21: 1563–1573.